Fear, Uncertainty, and Doubt. These three words are the bane of Bitcoiners’ existence. Cryptocurrency enthusiasts use the acronym FUD to describe any negativity that might be swirling around the market that causes prices to drop. And the FUD was strong this week, when the whole cryptocurrency ecosphere got fucked. 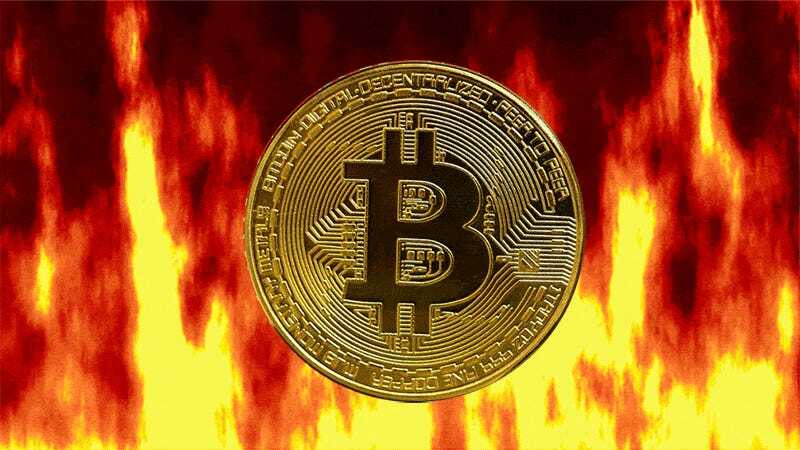 Two major corrections over the last month have caused the price of bitcoin to plummet by 45 percent, and the entire cryptocurrency market has fallen with it. So, has the bubble burst? Probably not just yet. When will it? Nobody knows. All that’s certain is that people who bought in at the peak of cryptocurrency fervor are currently getting their asses handed to them. Meanwhile, reports of people taking out loans and mortgages for the privilege of getting hosed are more common than ever. Financial outlets are already charting “the rise and fall of Bitcoin,” and on January 15, the normally unflappable loyalists on Reddit were straight up admitting that doomsday had come. Why is this happening? FUD. Over the course of 2017, the price of one bitcoin went from around $900 to just over $19,000. This led to average Joes wondering what they were missing and trying to figure out how to buy into this whole Bitcoin thing. In a month, bitcoin’s price jumped by 200 percent, hitting yet another all-time high. It seemed like it couldn’t fall—until it did. And then it did it again. There are a lot of factors driving fear in cryptocurrency markets at the moment, but from a big picture perspective, you can really focus on three factors: governments, whales, and ICO madness. In 2017, none of these factors seemed to be capable of taking down Bitcoin. Governments would make a comment about reviewing potential cryptocurrency regulation, the price would dip for a day and then rocket to the moon for a week. But lately, governments have been paying a little bit too much attention for anyone to feel comfortable. China has recently been particularly concerning to the cryptocurrency market. The country previously banned initial coin offerings and exchanges—two moves that had minor impacts on prices—China’s continued regulatory scrutiny is starting to have a more lasting effect. This week, Chinese state media reported that authorities were broadening their crackdown and scrutinizing “exchange-like services.” Simply put, China wants to eliminate all cryptocurrency trading that’s managed to continue under the current bans. This announcement came two weeks after the country imposed new rules that will adversely affect the many cryptocurrency miners in China, who are already struggling.. Until last year, China was the most active market for cryptocurrency trading, but it’s fallen to number 18 in the world according to market tracker Coinhills. Nevertheless, China is still the home of the world’s biggest mining operations. Since China’s participation in the market has slowed, interest in South Korea has become more intense. But that interest comes with its own set of fears. The Korean Won is now the third most traded fiat currency, and that has made the South Korean government increasingly nervous about Bitcoin and its relatives. South Korean authorities have made several market-shaking moves in recent months, and more recently, conflicting statements from Seoul have suggested that an outright cryptocurrency ban might be imminent. On the purely speculative end, Matthew Klein advanced an intriguing theory in the Financial Times. Klein thinks its possible that South Korea and China are coordinating their crackdowns on cryptocurrency in an effort to put more financial pressure on North Korea in the ongoing standoff over its nuclear program. North Korea is believed to have a large stake in cryptocurrencies and its state-sponsored hackers are often blamed for attacks on exchanges and spreading ransomware that seeks payment through digital cash. It’s an interesting scenario, but again, speculative. While many governments are trying to figure out what kind of limits they want to put on the market, others are introducing their own digital coins. Estonia has a coin in the works that would be used to reward foreigners who set up online businesses in the country. More disconcertingly, Venezuela and Russia have announced digital versions of their currencies in an effort that’s widely seen as a way of getting around international sanctions. In the case of government issued coins, it’s unknown if they will be a harbinger of a crackdown on non-state-sponsored cryptocurrency. In short: more FUD. And then, there’s the phenomenon of Bitcoin “whales.” Whales are people who own a lot of bitcoin. Market researchers at AQR Capital Management estimated that just 1,000 people own 40 percent of all the bitcoin in existence, giving just a few individuals have a tremendous amount of power to manipulate the market. That happened in November, when one person moved $159 million worth of bitcoin onto an online exchange and sent analysts scrambling to guess whether or not this whale was intending to sell out while the price is right. What’s most concerning about whales recently is the fear that some of them might be playing both sides of the field. In December, Wall Street started offering futures trading on bitcoin. Anyone can essentially place a bet on what the price of bitcoin will be by a certain date. This has led to speculation that whales could be participating in futures trading while pulling out or pumping in bitcoin to manipulate the price. On Wednesday, the first futures contract closed and those who shorted bitcoin won. And whales aren’t the only individuals who can swing the market. A recent study published in the Journal of Monetary Economics took a look at the potential for price manipulation in the bitcoin ecosystem. It concluded that when the price of bitcoin jumped from $150 to $1000 over two months in 2013, it was all thanks to two bots named Markus and Willy that were likely controlled by a single person. The bots were capable of taking advantage of a bug on the Mt. Gox exchange that made it appear as if they were performing valid trades with lots of bitcoin that didn’t really exist. Another source of FUD is the explosion of initial coin offering activity, also known as an ICO. An ICO is similar to the initial public offering on the stock market as well as an entrepreneur seeking venture capital funding. Someone comes up with an idea, they present a plan, and people fund it with cryptocurrency. But unlike the businesses on the stock market, an ICO can be practically anything. People have funded a single afterparty through an ICO. An ICO can also include the launch of its own branded cryptocurrency or altcoin. Ethereum was the most important ICO pioneer. It’s a unique blockchain technology with numerous applications for businesses, and it’s a currency called ether. While Bitcoin’s price went up 1,000 percent in 2017, Ether’s price rose by 8,000 percent. This has sparked a wave of offerings and a mess of people throwing money at any of them. Prior to last year, the money raised through ICOs was extremely insignificant. But in 2017, $3.5 billion flooded the ICO space. The ICO trend seems shady, too. It’s tough to say how many of the hundreds of ICOs out there are scams, but it’s a large number. OneCoin was a particularly prominent Ponzi scheme that bilked investors around the world out of $350 million, seems to have never issued an actual coin, and resulted in the arrest of numerous organizers. Plenty of other scam ICOs are still flying under the radar, aren’t necessarily illegal, so they will probably never amount to anything. In the end, governments, whales, and ICO madness are just three sources of fear, uncertainty, and doubt. But there are plenty of other reasons that Bitcoin is such a risky investment. The fact is, no one on can actually give you good advice on cryptocurrencies except the whales, and they don’t really go around broadcasting their next moves. So for now, the FUD has people backing away, but one big swing in the other direction will have noobs coming back to the gold rush. If you’re thinking about becoming one of them, just know that the deck is stacked against you.